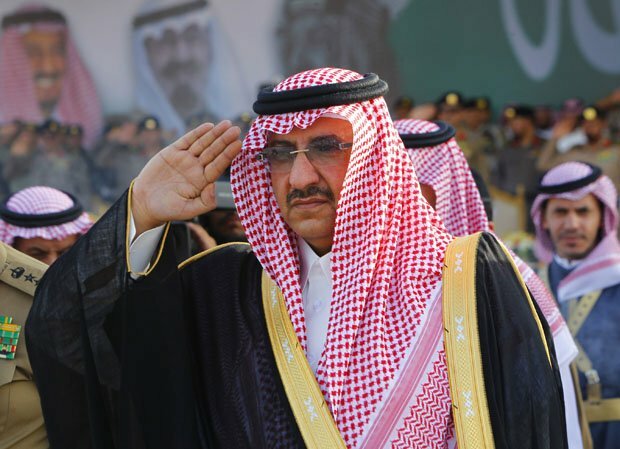 King Salman of Saudi Arabia has appointed his nephew, Prince Mohammed bin Nayef, as deputy crown prince. The powerful interior minister has become the second in line to the throne after Crown Prince Muqrin. The announcement of the deputy crown prince’s appointment on January 23, following the death of King Abdullah, quiets further speculation over future succession in the kingdom. It paves the way for the deputy crown prince to become the first grandson of Abdulaziz ibn Saud, the founder of modern Saudi Arabia, to succeed to the throne. Crown Prince Muqrin bin Abdulaziz, age 69, is next in line after King Salman. The moves by Saudi Arabia’s new king to ease the transition of power came just hours before King Abdullah’s surviving sons carried their father’s shrouded remains on a pallet atop their shoulders to his grave at Oud Cemetery in the capital Riyadh. In keeping with the traditions of Wahhabi strand of Sunni Islam, which frowns on idolizing the dead and dramatic public expressions of grief, members of the royal family and other mourners were somber and restrained, and the grave was unmarked. Prince Mohammed bin Nayef, 55, has been credited as the main force behind the eradication of al-Qaeda operatives inside Saudi Arabia when they waged a campaign to destabilize the kingdom between 2003 and 2006. He was appointed interior minister in November 2012. Also on January 23, King Salman’s son, Prince Mohammed bin Salman, was named defense minister, a position the new king held until he succeeded his half-brother, King Abdullah. In addition, Prince Mohammed bin Salman, age 34, was designated chief of the royal court, replacing Khaled Al Tuwaijri, who was removed from all his posts. Khaled Al Tuwaijri was an influential adviser to King Abdullah. The appointments signal the intention of the new Saudi leader to continue the government’s drive to curb dissent at home and Islamist and anti-Sunni forces abroad. In the kingdom, they also reassert the eminence of the Sudairi Seven, made up of the seven sons of the kingdom’s founder and Hassa bint Ahmad Al Sudairi, one of his wives. King Abdullah’s sons retained their positions, but the new royal appointments mark a reversal of the late king’s practice of elevating his sons and allies to senior positions. All other current ministers in the cabinet, including the oil minister Ali al-Naimi, will keep their positions, King Salman said in another royal decree. The appointment of Prince Mohammed bin Nayef as deputy crown prince resolves, at least for the moment, some of the questions that shadowed King Abdullah’s waning years. In particular, it sets forth a path for the transfer of power from the sons of the kingdom’s founder to his grandsons. Under Saudi Arabia’s monarchy, unlike most other monarchies, the throne doesn’t pass automatically from parent to eldest child upon the death or abdication of the monarch. Saudi law stipulates only that the throne passes to the “most upright” of the sons and grandsons of the kingdom’s founder. In 2006, the Saudi royal family established a panel designed to help future kings choose their heirs. King Abdullah and his successor, however, were excluded from its mandate. Under the provisions of the so-called Allegiance Committee, the king’s choice for crown prince is subject to a vote by the panel. If the committee disapproves of the king’s selection, it offers an alternative candidate. If the two sides still fail to agree, the committee votes on one of the two nominees.